Time for an update, only where to start? 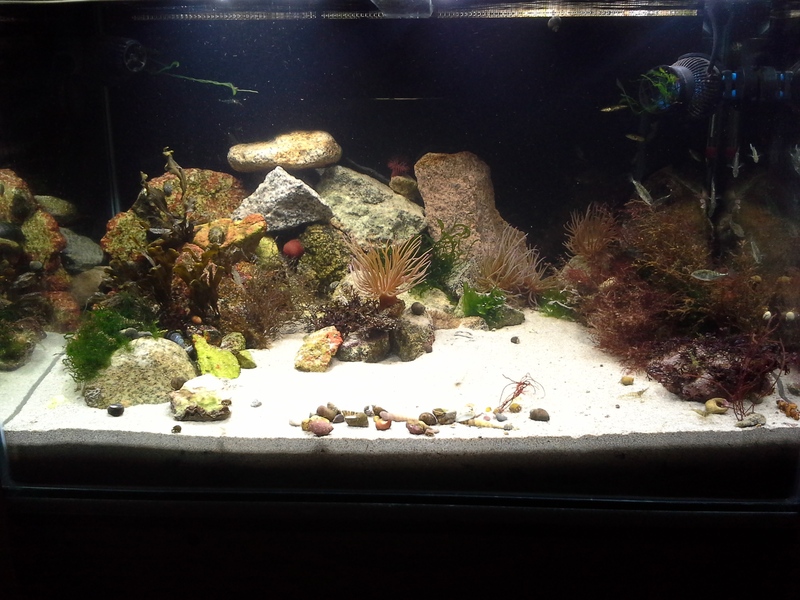 First of all an update of how the tank looks after a few more rocks went in and the overflow box is installed. Quite a lot of interesting stuff happening with the seaweeds since the new lights but more on that in the next post. Everybody else seems very happy. I feed Live artemia approx. every third day to the goose barnacles and whatever gets washed through the sump (which is a lot) is welcomed by the sticklebacks in the Display Tank. The Hermits and Gobies are doing well on cocked frozen mussel. I am now experimenting on marine flakes and pellets to get them a bit more variety. Some interesting stuff is happening with what must be a fairly big probably Lugworm. It doesnt seem to like my aquascaping and is reshaping the righthandside of the tank. Not sure if this can be seem in the pictures but the dome is about 12cm high and a its forming a 4cm deep hole on the otherside of the rocks. Obviously now some leftover food and broken off seaweed is collecting there on which it probably feeds. I had the skimmer running a couple of times but I am worried that it removes the artemia or copepods that I am adding and the foam doesnt look very dirty so as long as water values stay good I try not using it. Gobie with a chinese hat 😉 He actually dug the sand like this himself!